The Tony McEvoy-trained Sun City (left) is in doubt for the Magic Millions with an ankle infection. 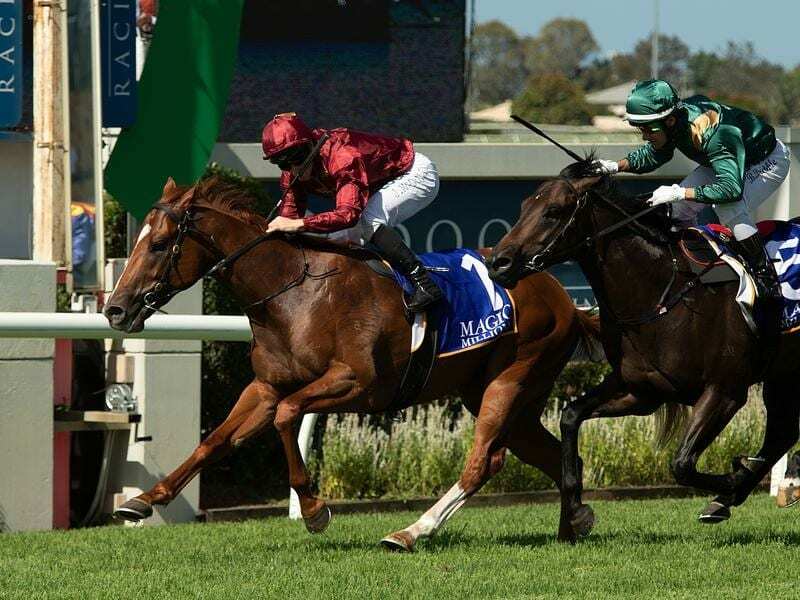 Leading Magic Millions Classic contender Sun City will undergo treatment for a swollen ankle in a bid to keep his hopes for the $2 million race alive. The Tony McEvoy-trained colt is a $9 chance in the 2YO Classic on January 12 after his win in the B J McLachlan Stakes on Saturday. McEvoy said Sun City had been in fine fettle on Monday and Tuesday but had a badly swollen off fore ankle on Wednesday morning and was taken to a veterinary hospital. “First thoughts were he had a sprain but history says that can’t be right. The next thing would be an infection and we have sent him to the hospital for tests,” McEvoy said. A Queensland Racing Integrity Commission spokeswoman said the situation was being closely monitored. “Obviously it is of great importance to a lot of people and we will keep the public informed,” she said. McEvoy won last year’s Magic Millions Classic with Sunlight.